Let me take a guess. You just found out you are going to be stationed in Germany. So now, you are here, doing what every good military wife does when they get their new orders (or even rumors of a new possible duty station) aren’t you? Don’t lie, it isn’t even official, but you’ve already taken to the internet to scour it from top to bottom to find out just what you and your family is about to get yourselves into with an OCONUS PCS. You might be hesitantly optimistic about jetting off halfway around the world. Maybe you are dragging your heels harder than a the kids in Heavy Weights going to fat camp. On the other hand, maybe you’ve already went and bought pants a size up because you know that aint nobody and aint nothin’ is going to stop you from trying the hundreds (yes, 100s) of varieties of schnitzles! It really doesn’t matter what side of the fence you are in, because whether you have already created a whole Pinterest board dedicated to all the places you are going to travel or if you have already started the mourning process of saying goodbye to your favorite local coffeehouse, mexican food and air conditioning (oh, and family…yeah, we better include them in the batch here, too) I know that you need some facts about your new life in Deutschland. Germany is on the UTC+1, also known as Central European, time zone. This means that there is a 6 hour difference (ahead) for EST, 7 hour difference for CST and 8 hours for PT. Noon in DC: it is 1800 in Germany. Tip: Use Google Calendar and “Add a Time Zone” that way you’ll always know what time it is back home and never have to risk calling your best friend accidentally at 2 am! Tip: Get a Service Credit Union or USAA account and use ATMs. They often have the best rates for foreign transactions fees and can actually reimburse some ATM fees as well. Check their websites for current fee schedules. Economical Excursionist Tip: When traveling, never use exchange offices (especially at airports!). Instead, just always wait to arrive and find an ATM first thing. Always get the local currency out (in the country of destination) to get the best exchange rates and save! VAT stands for Value Added Tax and guess what? As an American stationed with the military, you can be exempt from paying this if you have a valid VAT form (you can get these at the ACS (Army Community Services) building on Post.) The VAT is Germany’s sales tax which is automatically added onto items. The good part about the VAT is that when you shop, the price you see on the tag is the price you pay at the register. No more trying to calculate sales taxes or getting ready to pay just to realize you are 7 damn cents short because you forgot to take into account the tax, or are like me, and are just plain horrible at math. You’ll typically find the best value for using your VAT form (which costs you $4.00/each) when purchasing high ticket items. For example, if you went on a shopping spree at TK Max in Regensburg and spend at least 50 Euro (But let’s be honest here, who really just goes to TK Maxx and only spends 50 Euro!? ), it is worth considering using the form. While things like food, restaurants and hotels will not accept a VAT form, a few more examples where you should take one with you is if you intend on buying furniture off post or a beautiful Trachten (Liederhosen and Dirndles for fests). Even at some beauty services, such as massages, ask if they take a VAT. One of my guilty pleasures in Hohenfels was going to Belega Natur Spa and getting regular massages. Not only did I want to pack up Michaela in my bag and bring her back to the US with me when we moved (yes, she’s THAT good), but she took VAT forms to lower the cost! SCORE! Bottom line? Don’t be afraid to ask if an establishment takes a VAT form. 2) Look through the local Buy and Sell pages on Facebook, like the Hohenfels Kwik Klassifieds. Assuming you take care of your personal belongings, turn around and sell them back when you are ready to move back to the US. Someone is always looking for 220v items! 3) If you know you’ll be needing to adapt or transform your appliances ASAP, you can always get them before your move and have them on hand. (note, there are different transformer sizes and voltages as well, be sure you get the biggest ones for the right appliances, like this one). Buy some adapters before leaving, since you’ll want to use your basic appliances, like a hair straightener when arriving. Get a pack that has all the different kinds of adapters for different countries so you are ready in the future for trips to countries that may require different kinds. 1) Dual Voltage: Look at your power device on your appliance and look for something that will indicate the voltage. It won’t say “dual” but if it says something like “110v-220v (or 240v)” then that means that it is dual voltage and most likely all you’ll need is a plug adapter. A plug adapter allows you to plug in a dual voltage item with a US plug into a Europen outlet. Where a transformer will have a European plug that goes straight into the outlet and changes the voltage of electricity from 220 to 110. You then plug in your appliance to the transformer box itself. Germany has all four seasons of the year and each one comes in with guns a-blazing! In Bavaria, you can expect weeks, nay, months where you rarely will see the sun shine. When a ray does squeak by, you’ll feel like a vampire as you coward away and shield your eyes. Looks like a beautiful, clear day? Oh, how those Bavarian skies have fooled you! You’ll only get caught in an unexpected rain storm a handful of times before you quickly learn that you never leave the house without an umbrella. Summer: I heard how horribly hot summer’s got in Hohenfels. After two summers in Germany, I wondered what the heck everyone was talking about! Coming from Nebraska, where the average summer temps are in the 90s with high humidity, the typical Hohenfels 70 and 80 degree summers felt cold! I mean, if it is July and I am wearing a sweatshirt, something is wrong with this “Summer” picture! Granted, you are almost guaranteed to have a 2-3 week spell (often in July or August) that it can get quite toasty. I LIVED for these weeks! Other’s cried for their days of Air Conditioning gone by. If you are in the latter group, go ahead and start looking for window A.C units on the sales pages and if you see fans, stock up! If you are like me, don’t throw away those tank tops just yet. During those few days where it heats up, hit the pools and lakes and soak it all up while you got it! Fall: Just like in the a lot of the US, Germany’s fall weather will have you aching for your cozy warm sweaters and tall boots. You’ll be craving pumpkin flavored everything and the colors you’ll see will make you wonder if you are in a painting or if this is real life. Temps can be cool but pleasant. Think jackets, sweaters and sweatshirts. Winter: Just like summer, I heard that Hohenfels was treacherous in the winters! Despite every year’s rumors of “And this year is going to be even worse than the last!” as a Nebraskan born and raised, I just had to scratch my head when Post would close down for an inch of snow that you could sweep away with a broom! With that being said, if you are coming from a warm state, I could see the temperature shock for sure, but don’t be expecting blustering winters (too often). But yes, for those of you wanting to channel your inner Frozen, you’ll see snow every winter, meaning temperatures at least in the low 30s (and often colder). So pack (or buy locally when you arrive) your snow gear and warm winter coats, they’ll come in handy during those magical Christmas Markets all over Germany. Note: This isn’t to say that there isn’t snow and ice in the winter. If you are not used to winter driving, (black) ice is common on cold nights. SLOW down, learn how to drive appropriately and make sure to have a car that has at least front wheel (if not all wheel) drive. Know the Laws: It is required by law that you have snow, or at least “all season” tires for your vehicles. Just check your tires for a snowflake symbol or the letters “M+S” to see if what you have already on your vehicle will meet the requirements. If not, you can always order on Amazon (and yes, have it shipped to your CMR) or have the Autoshop on Post order for you. Getting caught without the proper tires can cost you a hefty fine with the Politzei. Nicht Gut! Chains are unnecessary unless you intend on doing mountain driving further South in Germany or into Italy and Switzerland and even then, you are probably ok without the chains. If you have all rear drive, consider a vehicle that will do better on the hilly, icy roads or at least get sandbags for the trunk, which will help with swerving. Sizes: Everyone always asks, “I have a giant SUV, should I even bring it over?” The answer really depends on what you are willing to put up with, where you might be driving or what other vehicles you have. Nothing says you can’t drive that truck over here, but just remember that many villages in Germany have teeny tiny roads. You don’t want to get stuck in a back alley way having a face-off with an old German lady in her little Mini Smartcar. You will lose. However, if you just plan on driving around on Base and not doing much exploring (Don’t be that person!) then a big ‘ol truck is probably fine. Alternatively, if you have another, smaller car that can get around those tight corners in cobblestoned streets in addition to your large vehicle then you have all your bases covered. Get a Hoopty: Instead, what most people do is they bring one, good, reliable car that meets all their needs. Then, when they arrive they go to the “Lemon Lot” on their base and look for an old clunker car that simply gets you from point A to B. It isn’t uncommon to see people driving cars that are decades old (Let’s just say our Opel hoopty was as old as we are!!) and it is often a great deal. You spend a few hundred dollars on an old, cheap car and you are good to get to and from work without having spent all that money on shipping and maintaining your second vehicle. Tip: You have to get your car annually inspected, but if you are purchasing a car on Base, ask to get it reinspected before making any final payments. It is an easy way to avoid getting an old clunker that you have to turn around and put money into right away. US Licence: If you intend on driving in Germany, you will need a valid, current US driver’s licence. I know, just one more thing to add to your “To Do” list before moving! USAEUR Licence: When you first arrive, if you need a rental until your car arrives, you will be required to have a USAREUR (US Army Europe) licence. A typical German is actually required to take a class that costs thousands of dollars, is hundreds (yes, as in 300+) hours of classwork and driving practice and pass a difficult test in order to receive a driver’s licence. All WE have to do is take and pass the USAREUR test. Therefore, go ahead and start studying before you head over so that it can be one of the first things you do so that you don’t have to be bumming rides from strangers to get anywhere. Note: This test is actually quite lengthy and is not something you will likely pass if you don’t study. You need to learn all the new signs and all the rules for driving in Germany and no, they are NOT the same as in the US. International Permit: If you intend of driving outside of Germany, you’ll also be required to have an International Permit (available only with a current USAREUR licence if obtaining within Germany). You can get this at the Rathaus (city municipality) for the cost of only 15 Euro. Again, if caught without this if driving outside of Germany, be ready to pay a lot of money in fines. Tip: You can actually get an international permit in the US at any AAA, but these will only be good for 1 year, as opposed to the 5 if you get it in Germany. As military personnel on orders, one of the best amenities we get is US gas prices!! We are talking HUGE savings here compared to gas on the economy. It is no wonder public transportation is so good and efficient in Europe…who wants to pay those gas prices!? Your car will be rationed to 400 liters per month but I have yet to meet anyone who exceeds their limit, even with plenty of travel. To get your fuel card, you just simply take your registration paperwork to the PX customer service and they set you up. You can then use this card at any Esso station within Germany only (and on any Post/Base in Germany). When you need to put more money onto the card, you can simply go top up back at the PX. Note: Your fuel ration card is ONLY good for travel within Germany. Even if you are stopping at a military installation in, say, Italy, your card will not get you US prices, even on those bases, so plan accordingly. Have I convinced you why you need to make travel a priorty during your time abroad yet? Good! But with that does come the chance that you WILL have car trouble. I was that person in the US that never had AAA. Why? I’m cheap.as.hell. 1) Our car wouldn’t start in the Munich airport (approximately 2 hours from home) at 10pm at night after 2 weeks in Greece. Ok, ok that was a little worth it to have them come and jump start us. 2) After backpacking in Asia for two months, our other car decided to not start in the parking garage at home. Being a 1 car only family, it was kinda a necessity to get the “BlAuto” (our blue, auto), as we liked to call her, started again. Alright, so ADAC so far was good for not inconveniencing friends to come jump start us. But was it REALLY worth it? b. have ADAC actually PAY for our train tickets back home to Germany (part of our ADAC membership) AND tow the car….ALL THE WAY FROM POLAND at no additional cost than our annual fee! UUUUUH. Never before in my life, besides the day I married Andy, had I been more sure of committing to a plan before. That annual ADAC fee? TOTALLY WORTH IT!!! 1) Prepaid Burner Phones: You can get little prepaid burner phones in Germany and nobody is going to think twice about the fact that you don’t have a smartphone. In fact, it is EXTREMELY liberating not being tied to a phone. Seriously. – Since Almost all German internet plans come with a land-line plan, I almost never used my cell phone. I could go months without burning through my 20 Euro top up! 3) Contracts: I have yet to meet someone who got a contract for a phone in Germany and been overly happy with the outcomes. Service is often intermittent (in some locations in Germany, like where we were at in Hohenfels, getting service was sometimes just a matter of walking in or out of my house, or down the street!) I’m not sure if people selling phones and plans get a commission on contracts because they push them hard. However, know that they are NOT like plans in the US. There are no military clauses letting you out of a contract, you often have to cancel 3 months prior to your cancellation date or else be locked into another FULL year and other fine print that often causes a lot of headache and costs plenty of money. Going this route isn’t cheap either. You can expect to pay anywhere from 70-90 EURO per month, per phone for a smartphone with data. And since you aren’t even sure if you’ll get service where you want it, that is a lot of money to be spending. If you do go this route, ask around when you get there about service, people’s experiences and read ALL the fine print in your contract. Here is some great info on what to look for. For years, people have warned “DON’T USE YOUR PHONES OUTSIDE OF GERMANY!! !” And for good reason. It used to be that if you used your phone in another country, you’d return home to simply outrageous roaming charges (as in hundreds and hundreds of dollars/ Euros). But alas, there is a light at the end of the tunnel! As of June, 2017 all countries in the EU will no longer have roaming charges for calls, texts and data usage. I get it. It’s Sunday night and all you want to do is watch Game of Thrones. And no matter how many times you have threatened your Facebook world that you WILL delete anyone that gives spoilers because you haven’t had a chance to watch your show due to time zone differences, some jerk still manages to give away the cliffhanger! Oh what to do!? AFN: If you live in government leased housing, it is generally pretty easy to get AFN. This is “ok” if your favorite shows are the hot hits of the year. However, if you like watching other programs that may not be as popular, staying on top of your newest shows will be hard. If you live in a private rental/ off post, you will have to get an AFB box and router. This is a bit more of a nuisance but completely do-able and hey, who doesn’t love their cheesy AFN commercials!? It is often nice to just hear the news in English if nothing else. Same goes for streaming. Just know that streaming isn’t “What Right Looks Like” (aaah, gotta love those AFN commercials!!) and is the perfect example of “Just because everyone else is doing it, doesn’t make it right.” So, again…do your homework and then be smart. German Sites: Most people who are weary of using VPN blockers just resort to using the German versions of things like Netflix. There are plenty of English/ American tv shows to watch, even on the German versions. This is not going to be for any tv buffs though, as not ALL the top American shows are always on the German version. However, for those who just want to watch some shows here and there, it is a good option. Hulu and Netflix: If you live on a US Base or Post (not just government housing), you can supposedly call services like Hulu and Netflix and they can white-list your address to get the American versions of their programs. Furniture: I love me some IKEA, but the reality is that IKEA furniture isn’t exactly known for it’s top quality. If you do want a good quality couch, for example, expect to pay some big bucks. Many people go to the furniture stores on Post/Base but even those aren’t giving you big price breaks. If you know you will need a baby bed, new family room furniture, etc it may not be a bad idea to buy it in the US before your HHGs are picked up. Vitamins: Vitamins are one of the restrictions in the CMR Mail. Therefore, if you know you take a certain vitamin, like prenatal, or supplement regularly, stock up before your goods are picked up. You can get all of these in Germany, but it may not be the particular brand or quality that you prefer. Protein Powders/ Supplements: Supplements also are not allowed to be shipped in your CMR due to customs regulations. If you have that one supplement that you can’t live without or are picky about the ingredients on, get some extra before heading over. Otherwise you’ll have to resort to what they have in the PX or find a German version on the economy. Lithium Batteries: Lithium battery rules seems to come and go. Therefore, if you have something that needs a lithium battery, consider buying a back up before moving just in case. Salsa: No? This one is just me?? Germany, I love you, but you just can’t do Mexican food! I always stock up on all the varieties of Trader Joe’s Salsa every time I am back in the States so that I have plenty to work with back in Germany! Hey, a girl’s gotta do what a girl’s gotta do. Just about everything else you can get locally, on the economy or online. Having a CMR (Community Mail Room) that gives you a US address, even while in Germany is a God-send!!! Now a days, you can order just about anything under the sun off of Amazon, which makes the pain of not being within thousands of miles of a Target almost bearable! During in-processing, you’ll receive your CMR box number. Give it to your family and friends ASAP and let them know that it is the exact same postage and charges as sending something right within the US. No outrageous international fees!! Tip: Family sending packages? Tell them to send it in a FLAT RATE box. It’s exactly what it sounds like- a flat rate cost pending the size of the box, not the weight. The common motto with these are “If it fits, it ships!” My mom has been known to pack that puppy to the brim!! A few caveats: While your CMR is absolutely perfect for ordering anything from clothes to vacuums to baby beds, there are some restrictions. It is best to talk to the CMR to get the full list but things like vitamins, supplements, meat, coffee and medications are absolutely off limits. Also, it is for personal use only, therefore if you run a Home Based Business (which you’ll also need separate approval for), don’t even risk it. Tourist Passport: It’s no secret that I think that EVERYONE who gets stationed in Europe should travel, Travel, TRAVEL!!! I know you have a checklist a mile long going of things you need to be doing, but at the top of that list write, “Get tourist passport!” Now, underline it. Never mind, just apply right now. Official/ No-Fee Passport: You will get an official, no-fee (free) passport through the military, which will have a SOFA (Status of Forces Agreement) stamp in it. Think of this kind of like a “Green Card” for being able to come, go and stay in Germany during your PCS. Without this card, you wouldn’t be able to stay in Germany past 90 days, so this is gold. However, this only applies for your stay in Germany. Therefore, if you plan on traveling (which you DO plan on doing…right? RIGHT!?) you need a tourist passport, no exceptions. Get a SOFA Card to put into your passport: If you are a Civillian, you’ll need the AE Form 600-77A. If you are a dependent, have the Military Personnel Division verify your command sponsorship and then you can get a separate, blue, laminated card. The only caveat to this is that you.can not. lose.this! So, do whatever it takes to ensure that it stays with your passport, even if that is just a sturdy paperclip, like I do. However, if you can ensure it’s safety, having the card and a tourist passport beats the hassle of figuring out which passports to use when. So, are you heading to an OCONUS PCS to Germany? If so, just remember that no matter what you have heard from the rumor mills, no matter what you’ve seen on Facebook and no matter what you have read in the news about Europe today that you need to go into this next duty station with an open heart and open mind. Who knows, you just may end up falling in love with travel and Europe and will never want to leave! 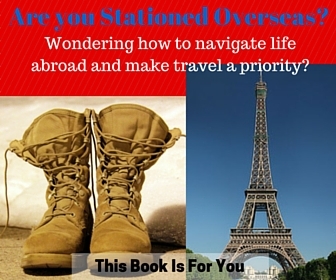 Still a bit tentative and nervous about your move to Germany? TOTALLY understandable! Let me know in the comments what other hesitations or questions you have and I’ll do my best to help ease your mind and give you the answers! Are you currently, or have you been, stationed in Germany? What tips did I miss that could help a fellow military family out? Heading to Hohenfels, Germany? Here’s a little of what to expect when heading to USAG Hohenfels as well as what it can offer you. Coming soon: Hohenfels FAQ and Resource Guide. Wow- you have included so much information here! I really appreciate everything you included about the weather – I always like to know what the weather is going to be like before I go somewhere, as I hate being cold and want to know what to pack! Nothing worse than packing a bulky jacket in an already too small suitcase, and then not needing it. I also really like you tips about stocking up on certain things beforehand – I too have certain items I can’t live without, and would be lost if I wasn’t able to find them. Great idea to bring them with you! What a lot of useful information. When I was living in Argentina after a while I had memorised that it was 8 hours ahead of New Zealand, and became very good at calculating the time in my head for when I could call home. Yes! You quickly memorize times. When I had the baby I knew that at exactly 3pm I could call my parents without them griping about waking them up! Such a helpful guide for those planning on making the move to Germany- whether with the military, or simply as an expat! Thanks, Tamara! Moving to a whole new country can be scary, hopefully it helps out a few people on their way over. This is a really insightful post about living in Germany. I have to ask, what is a PCS? Great question, Suze. It’s a “Permanent Change of Station” for US military personnel. I’ve never had any experience with military families, but this is such a thorough and comprehensive guide for anyone impacted in this way! I know a fair bit about Germany, and this is a pretty good summary – especially the bit about the weather! Holy cow what an absolutely thorough list for visiting Germany. I lived in Trier for awhile and I can agree that the weather doesn’t do what you want it to do- even in the summer I sometimes saw three weeks of grey clouds! We often joked that we lived in the land of “Grey” as we could get MONTHS with no sun! But when it does come out, oh how beautiful it an be! You seem to have covered it all. Such details – from passport to electricity and licenses. Good job indeed. Sharing it with a set of friends who are incidentally heading there soon. This is great advice for people getting stationed in Germany. Does some of the off base housing not have 120 V outlets as well as 220V? In the UK a lot of off the base housing has both installed to make it attractive to the US military personal. I’ve yet to head to Germany but there are great tips for a visit even if you are not a military wife:) I could see myself falling in love with Germany! Thank you, thank you, thank you for all of this useful information! Do you know what free music service (i.e. Spotify, etc…) will work while stationed in Germany? I’ve tried to access a few of there services that I used in America but I keep getting weird German emails and I can’t access the music from my wireless speaker (Sonos). Yup. Gotta love the regulations! Jango works over there though. Similar to Pandora. Hi, Leanna! Great article. I’m wondering about pets? My husband and I have two dogs (60# and 90#) plus an indoor cat. What are the regulations? Can we buy a house with a yard in Germany vs renting? Some dogs need special permission (you can contact the Garrison for a list) due to the breed and German laws. We brought our cat with us. Some people buy, but if you are military (not contractors) I don’t know if that is advisable considering only being there a few years. Plenty of rentals have great yards for the pups! I just got done reading your blog…we are due to leave to Germany this summer. I have so many emotions boiling up inside me, and you have erased many of them. Thank you so so much. I really appreciate all of this information, I have written down many notes that I will be following upon our move. Right now it is mostly fear of the unknown…I hate not knowing what to expect with education systems, how to take shuttles from point a to point b, taking the kids to school and picking hem up. Do you happen to have information on the school systems in Germany? We are going to live off post (maybe), we still do not know where exactly (this was a suggestion made by my husband’s sponsor, he voiced his frustrations with on post housing saying it was too small…I really do not care for the housing size as long as my kids and husband are close to me). I mentioned school system and kids…I have 7 year old boy and a 5 year old girl. He will be entering 2nd grade, and she will be entering 1st grade. Do you recommend on post housing or should we stay off post? Did you learn the language? Again thank you for all the information you have provided. My biggest advice is to go in with an open mind. Many people who don’t like living there are the people that never left Post and never really tried to EXPERIENCE anything there. DON’T be that person! I assume your kids will go to school on Post? There is bussing to most major surrounding villages and even some of the smaller ones. You can contact them to see their list. We lived off post and loved it. There is nothing wrong with on Post though. However, Hohenfels is very much a “Small Town” mentality. So, if you are on Post, everyone is likely to know your business 😉 Living off post also encourages you to use the local grocery stores, trains, etc which is where you’ll really fall in love with Germany….the local life!